I think I might have joined the cheap wagon club. I picked up an 82 wagon that I didn't intend to buy as the engine ran so poorly, and I couldn't discern what the problem/problems were. The seller was over his head, and just wanted to get rid of it. He managed to drive it around the block and onto the trailer. I didn't have much hope for how the engine ran, but hey, it at least was a nice source of parts. I have had this thing for at least 9 months, and done nothing until yesterday, when a bit of spare time and curiosity got the best of me. Jan had left his injector tester here, so I pulled the injectors to pop test them and take a look at the prechambers. I found one injector that would not open at 2500 psi. One opened at around 1600, two opened near spec pressure, and the last one pissed diesel out with out even registering on the pressure gauge. Only one of the two near spec had a decent fine spray. I'm pretty impressed that the engine had enough umph to even drive on the trailer! I gathered up the loose injectors that I had around and pop tested the rest, and pulled the 5 best out of the bunch and put them back in the car for a test. Best is a relative term here, as the pop pressures ranged from 1600, to near 2100. Still the engine started easily and the amount of smoke out the exhaust was greatly diminished. The engine does rattle a little, but I can also see a stream of small air bubbles going through the pre filter. There may be hope for this engine yet! I need to rebuild a set of injectors for it and start on the normal procedures of fluid changes, valve adjustments, etc., and figure out just where I am on this engine. The car only has 180K miles on it, so unless it has been neglected should have lots of life left in the engine. We'll see. Sounds a bit like my 1984. As-found, 3 of the 5 injectors popped at 1600 psig and were labeled such. Someone had installed replacements for a non-turbo engine. Interestingly, after replacing w/ the correct 1950 psig injectors (and pop-testing all), the engine ran about the same as before. Your stuck injector may have rusted-up inside the nozzle, but replacement nozzles are only ~$30, and the housing may still be good. If you have the original white plastic hand pump, replace it since they notoriously allow air to be sucked in, and replacements w/ better design, are <$10. 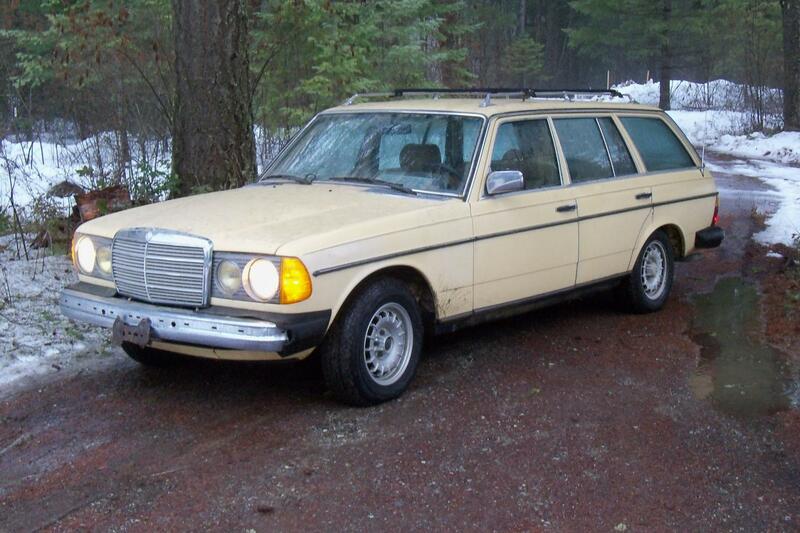 Another Cheap W123 Wagon ! I love my cheap (to buy) 300TD grey market wagon . So far everyone else does to as every where it goes folks ask about it and will I sell it . Do all the normal deferred mtce. stuff on it,valve adjust, replace the hoses and filters, do a diesel purge then report back . How about some pictures too. I would add an image, but it appears that the images needs to be hosted somewhere else, and I don't have any place to place images. Try texting the picture to your phone before you try to u0load it. Is that a method of reducing the pixel count ? Once he has done that.. how does it get to the thread ? When on your computer, if you click on the Go Advanced button in the Reply window you can then click on the the Manage Attachments button and upload files directly from your computer with the Choose File button. With this method you don't need to resize the image, the website does it for you. Bonus is that you can right click on the image to open it in a new tab and view the image full size....and you can grab that url of the image from the newly open tab and insert it in the body of your text (even before you post). Last edited by Alec300SD; 01-20-2018 at 01:26 PM. I did finally find the attachments menu, but apparently the file is too large and I get an error. I am not aware of what if any software is on my computer to resize the image. I don't have a smart phone, so that option is out. I had the wagon buried, but pulled it out to work on it. Here is an image of the needs to be washed wagon! It looks nice to me ! . As above, looks like a really nice score!